Andy: This rum is thick, sweet and has a potent manufactured vanilla extract flavor, with the slight hint of orange peel. 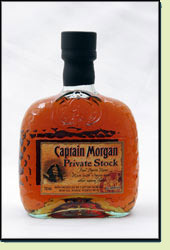 If you like Captain Morgan rum, then I think you will really be pleased with this rum. It is a nice upgrade. When mixed with Diet Coke, the light spice flavor really stands up. This rum is really how we got started reviewing rums. We liked Captain Morgan, so we thought we should try this. We liked it so much, we were wondering what other delicious rums were out there. While this may no longer be my favorite, it is definitely a great starter rum (especially for the price) for the rum lover in your life! I like to keep a bottle of this around to judge all other Rums. Every great Rum has its own individual taste, but compared to Private Stock most are second best. Pour two shots of this Rum and sip it with no ice to numb the taste buds. It is light but flavorful and just about as good as it gets !